The Elgin Fire Department is undergoing major changes as people who were part of a hiring wave in the late 1980s and early 1990s have retired, and officials have ramped up efforts to increase diversity among new hires. 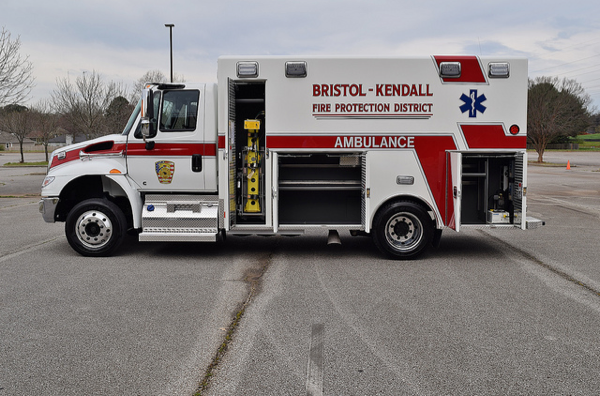 The latest change will affect one of two assistant fire chief positions. 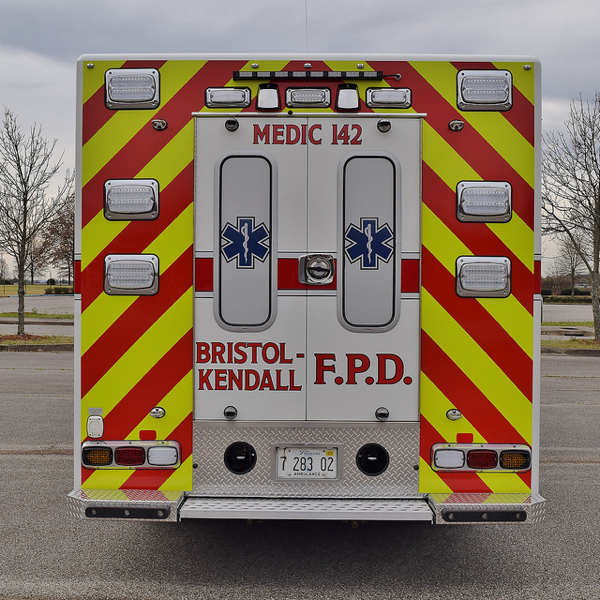 Assistant Fire Chief Bryan McMahan will retire Friday and Battalion Chief Richard Carter, a 28-year veteran, will be promoted to the post next week. That will trigger three additional promotions within the ranks, Fire Chief Dave Schmidt said. Fifteen people retired in just under three years. One person with 40 years of experience and another with 30 years of experience retired this year, and another one with more than 40 years is retiring in August. Like most suburban fire departments, Elgin’s is predominantly white and male. 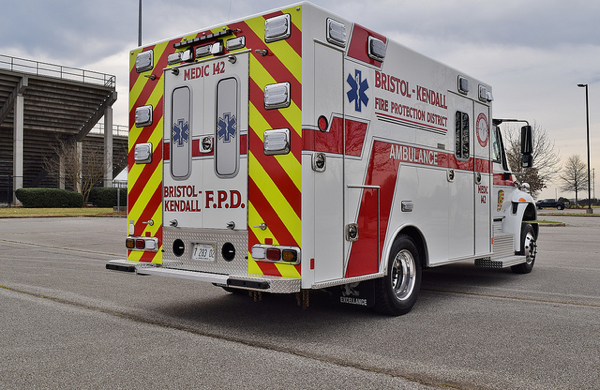 In an effort to increase the pool of candidates, the 133-firefighter department last summer dropped a requirement, first established in 2000, that firefighter candidates have 60 college credit hours. Six firefighters were hired in January, including one woman and one who is Hispanic, Schmidt said. The top candidate on the eligibility hiring list was a woman who ended up taking a job elsewhere. Efforts to increase diversity within the Fire Explorer program have been successful, and the hope is that the program’s youths will apply to work within the department when they turn 21. Carter, the future assistant chief for administration, is a product of the department’s succession planning, which encourages firefighters to rise through the ranks. Carter was a paramedic and on the technical rescue team and has been on the training division for 15 years. He also was director of the former Elgin Regional Fire Academy. The promotion ceremony for Carter and the others is at 3 p.m. April 10 in the Heritage Ballroom of the Ed Schock Centre of Elgin, 100 Symphony Way, Elgin. 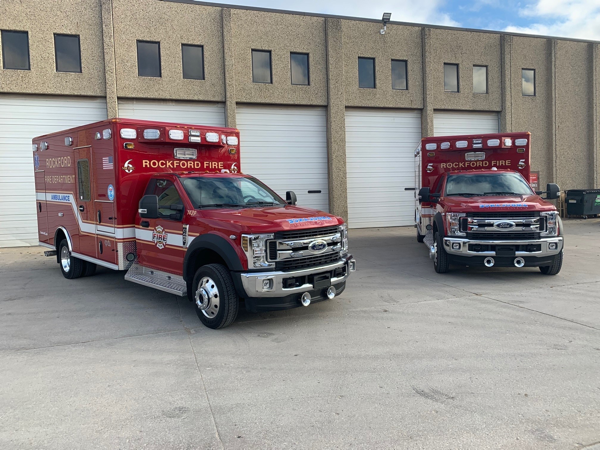 Fire Service, Inc. would like to congratulate Chief Derek Bergsten and the City of Rockford Fire Department on their recent delivery of two 2019 Wheeled Coach Type 1 F450 4×4 ambulances. 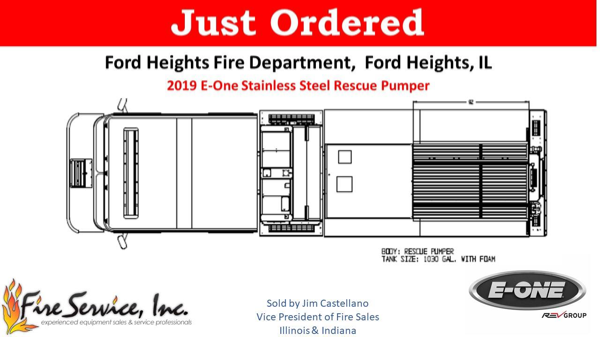 These are the 15th and 16th Wheeled Coach units Fire Service, Inc. has provided to Rockford Fire. 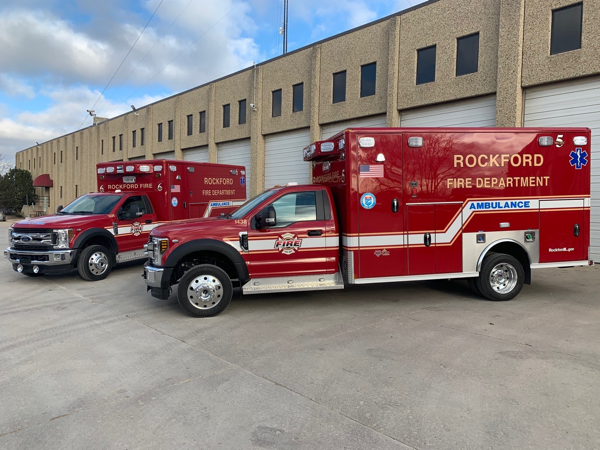 Rockford has incorporated a custom designed unit, affording the exterior storage to accommodate the suppression needs as well as interior accommodations to provide the highest level of Advanced Life Support within their city. 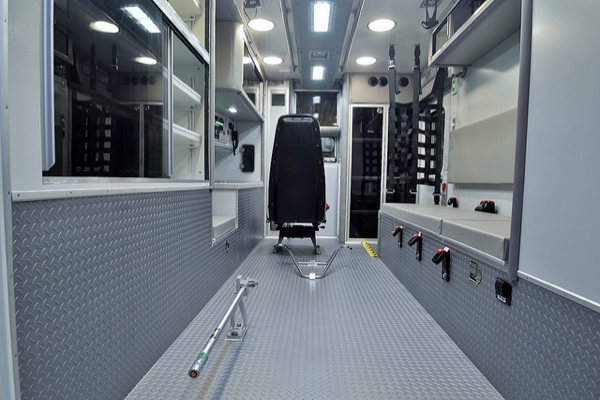 These units have driver and passenger side SCBA/ turnout gear storage, Whelen warning systems (including M Series LED exterior warning and flood lighting, Whelen dual amp and Howler Siren and interior LED lights), Stryker Power Load systems, Stryker Power XT Cots and stair chairs, Hanscom driver back up and interior module cameras, Knox Med Vault, Dometic temperature controlled medication drawer, IMMI Per4Max restraint systems, and Paramedic Design acrylic organizers. 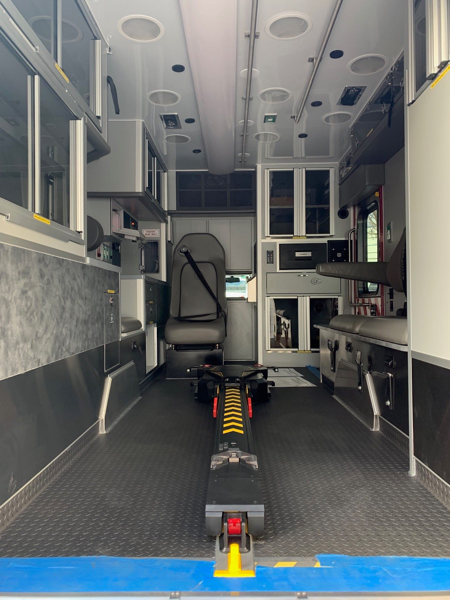 With KKK Change notice 10 interior cabinets, patented Wheeled Coach Cool Bar HVAC system, and a full reflective graphic package, these urban Type I ambulances are ready for an EMS mission ready response. 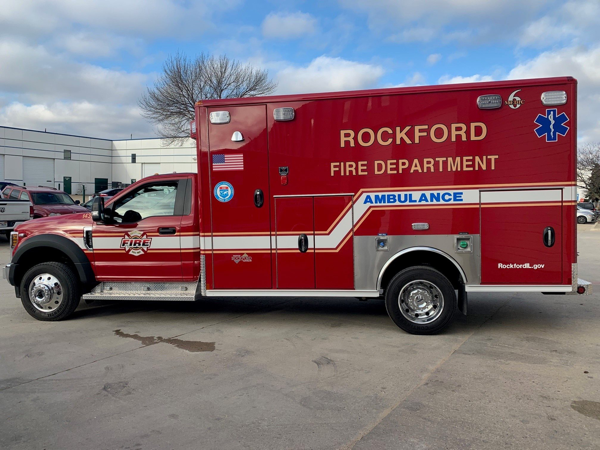 Rockford has chosen Fire Service, Inc. and Wheeled Coach as their provider for ambulances since 2012 based upon the quality, durability, and reliability of the product accompanied by world class service and support at the dealer level. 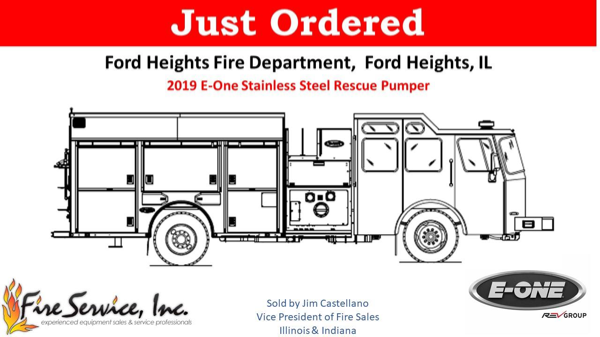 This is a significant partnership between Fire Service, Inc. and the City of Rockford, and we couldn’t be happier to have them a part of the Fire Service, Inc. family. 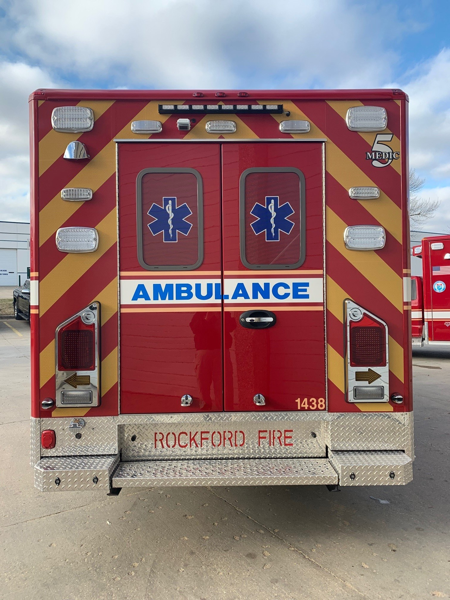 Rockford FD Medic 6 will be on display at FDIC April 11-13 at the REV Ambulance Group booth #4321. 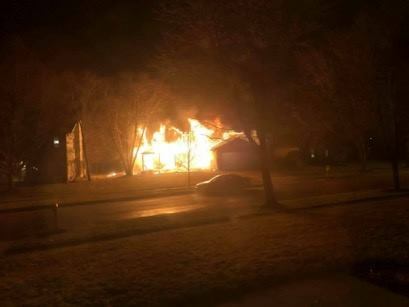 Dispatched at 2156 hours for a structure, police arrive and report it fully involved. First arriving E-2 found heavy fire on three sides and “B” exposure getting started. They called defensive and went to work with their deck gun and 2 1/2″ hand line to the B-side exposure. 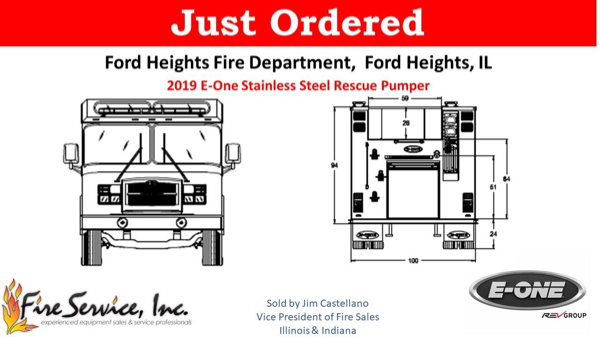 E-1 arrived and pulled skid line to the D-side. Quick initial knockdown with DeKalb T-1 put to work due to structural issues. Gas fed fire on B-side going until Nicor arrived to dig and D/C the gas. General alarm fire with Cortland and GK engines, Hampshire Truck, and COQ companies. A couple folks evaluated for smoke inhalation no injuries to FFs. 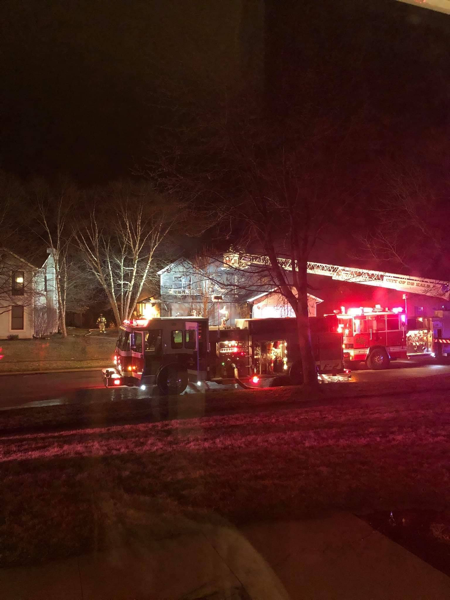 Late last night into early this morning, the fire department was called to the 1300 block of Janet Street for a reported structure fire. First arriving fire crews found heavy fire engulfing the majority of the structure and initiated a quick defensive attack using a master stream device with tank water carried on the engine. The bulk of the fire was brought under control in approximately 60 minutes. 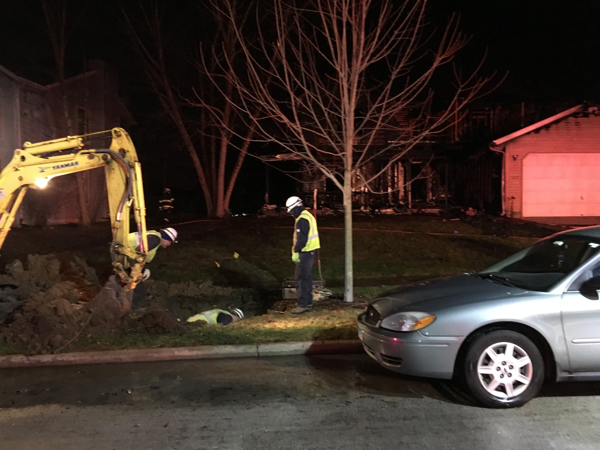 A natural gas fuel fed fire involving the gas meter was kept in check by fire crews until a NICOR work crew were able to locate and shut off fuel to the meter. Fire crews remained on scene for approximately two more hours doing overhaul operations. 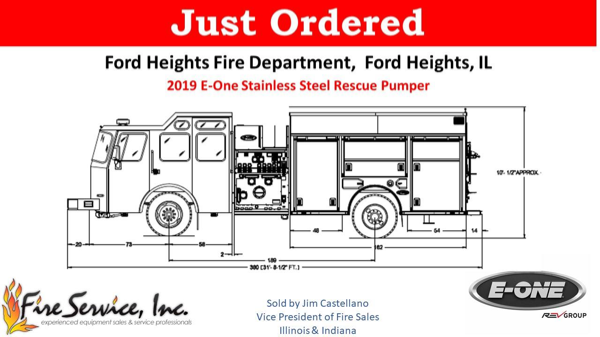 A great job by the initial arriving fire companies to knock down an overwhelming fire along with valuable assistance provided by our mutual aid partners. There were no injuries to firefighters or residents. 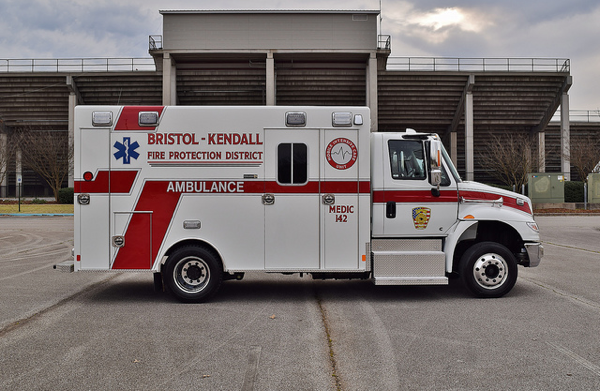 Two individuals were evaluated by an ambulance crew on scene and refused treatment or transport to the hospital. The initial estimate of damages from the fire at 1319 Janet Street are approximated to be $300,000 to structure and contents. Heat from the fire damaged a neighboring house at 1311 Janet Street. The initial estimate of damages at that property are approximately $50,000 to the structure. 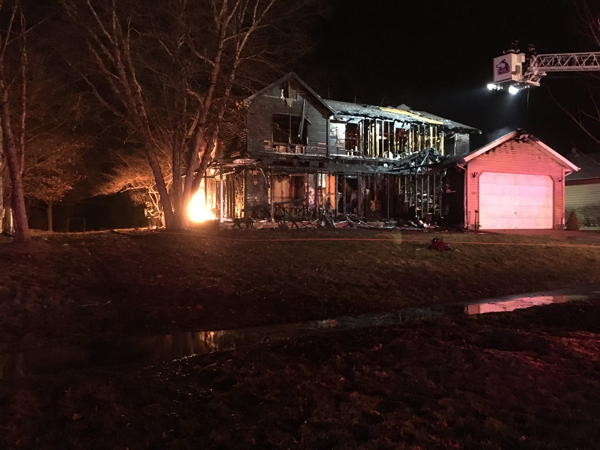 The fire went to the general alarm level and assistance was received from several neighboring fire departments including DeKalb, Elburn, Genoa, Hampshire, Burlington, Cortland, Pingree Grove, and Hampshire. The Sycamore police and public works department also assisted along with Nicor and ComEd. The cause of the fire is undetermined pending further investigation.